Using a grey bronze hand-folded pigmented zinc sheet for the ribbed cladding as an expression of the handcraft taking place daily inside. However one shouldn’t overlook some of the building are other qualities. The hand folded zinc has a precious and precise quality amplified by the changes of luminosity derived from changing light conditions. Games are also played with the depth and spacing of ribs alluding to surrounding architectural features. Any notion of an ordered setting out of fenestration is dispelled through widely differing proportions of individual windows. Internally the choice of an unfinished cross-laminated timber panel structure complete with all its imperfections together with the compressed scale of the principal rooms already give the working environment a welcoming lived-in quality. This is exploited in what the architects call the “social staircase” with its numerous alcoves for small scale artefacts and curiosities. 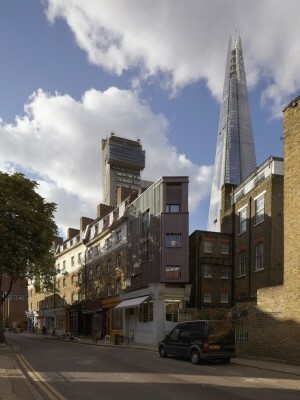 It was extraordinary to learn that the zinc cladding was opposed by the local planners right up to the planning committee meeting on account of it being out of keeping with the largely masonry nature of buildings within the Bermondsey Street Conservation Area. 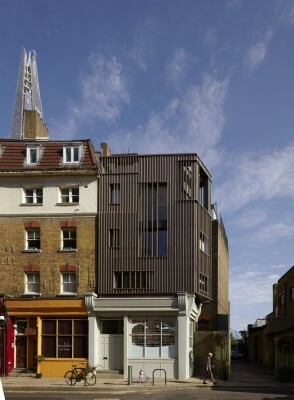 Both client and architect should be applauded for sticking to their guns.